Maybe I’m just used to the normal kid’s book media tie-in methodology where the book just clumsily retells a story that was previously told better in another medium. But, at its core, Star Wars Head-to-Head has an infinitely more engaging mission. It’s a book designed to be a discussion starter. Yes, it’s filled with clumsy instruction manual-esque prose and photoshopped artwork, but every two-page spread is actually asking its reader a question – “Which one would you pick?” And that one simple question turns those readers into active participants with the book. 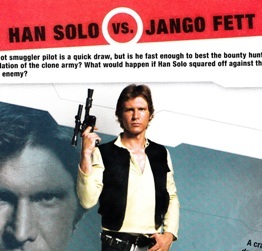 And then, at the bottom of every spread, Star Wars Head-to-Head doubles down on its concept and says “Who wins? See page 64” (an act that I call “pulling an Encyclopedia Brown“). The decision by the author to declare a winner in each battle cleverly opens up yet another avenue for debate. My daughter and I spent half the time debating each other and the other half debating whether the author was a genius or an idiot. 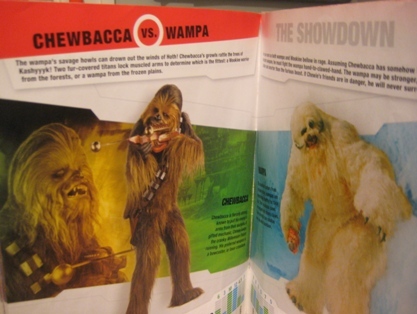 I should also note that when the book asked who would win in a battle between the Millennium Falcon and Darth Maul’s Sith Infiltrator ship, I turned to my daughter and said, “Just so you know, if they don’t say that the Falcon wins, I’m throwing this book in the garbage and I’ll reimburse your teacher for it.” And, fortunately for the book-in-the-bag program, the correct answer was on page 64. 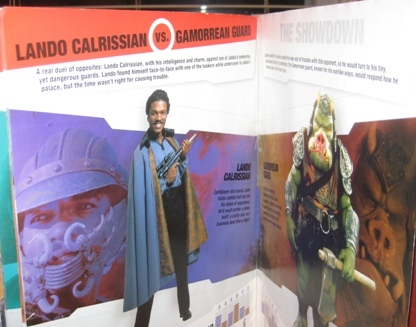 This match-up… I’m pretty sure this is the “Star Wars” equivalent of racist, right? 2. If you want to engage a young reader, books that inspire discussion and/or debate can be an amazing tool in your repertoire as a parent. Think about people you know who are really, really passionate about certain topics. It could be a political cause, it could be fantasy football, or it could be all about the inherent flaws/triumphs of Ridley Scott’s Prometheus. Those people read up on their favorite topics again and again because, on some level, they want to be able to engage in informed debate around those topics. So, using books to start a debate with your kid about something they really love (Legos, princesses, etc) might be a good way to really get them reading more actively in the future. And I totally respect that. 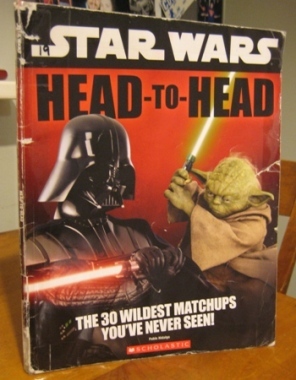 While I will begrudgingly admit that we had a lot of fun with Star Wars Head-to-Head, I would never call it a “great book.” It’s clunky, it reads like marketing copy in parts, and our reading of it was greatly enhanced by my own knowledge of Star Wars lore. This is not a book for everyone. However, if you are looking for a kid’s book that will inspire debate AND is also a quality work of children’s literature, I think I have just the book for you. 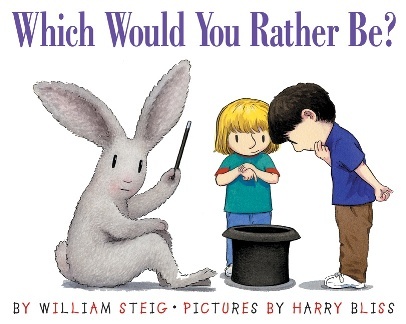 It’s a picture book called Which Would You Rather Be?, written by William Steig and illustrated by Harry Bliss. Which Would You Rather Be? is their tremendous picture book collaboration that stands as one of my daughter’s favorite titles to check out from the library. The premise is pure, brilliant simplicity. A rabbit asks a boy and a girl “Which Would You Rather Be?” and then presents them with a laundry list of options. Which would you rather be? A stick or a stone? An elbow or a knee? A cat or a dog? The list goes on and on. Soon, you’ll find yourself asking your kid if they’d rather be a flute or a tuba, candy or cake, a moon or a sun? And that’s all it takes. Those silly, simple questions can start HOURS of conversations with your kid, if you’re really willing to discuss the options with them. My daughter got so wrapped up in trying to figure out the pros and cons of each option that we actually had to stop reading Which Would You Rather Be? at bedtime because she wouldn’t stop talking about it and go to sleep. So, if you’re apathetic about the idea of debating pop culture with your kid, Which Would You Rather Be? is an amazing picture book alternative for inspiring wider debates with your child. It’s an exceptionally fun book to read aloud, the illustrations are sparse and beautiful, it has a much broader appeal than Star Wars Head-to-Head, and it has a terrific creative pedigree behind it. What more could you ask for? We homeschool but I still hope my son doesn’t see this particular title at the library! He discovered the ‘Star Wars’ section at one of our local libraries and now insists on adding a few of them to our take-home pile. And thanks for the recommendation for ‘Which Would You Rather Be?’ It’s on our list! If you’d like, I collected a list of “Sustaining Books’ for our Primaries & Juniors (K-3) and Intermediates (4-5), which I can send to you. I’d actually love to see those, if you don’t mind. Thanks! As a parent and a school librarian, I so enjoy your blog. At our school, what you call dessert, we refer to as a dorito. After a few doritos, I usually insist that a student read a nutritious meal. I don’t want to hear the sound of the malnourished brain shrinking away from the skull. I love it! “Dorito” is such a PERFECT term for those kinds of books – I’m going to happily steal that for my own purposes now. I tried to send this list as a PDF via email. Success?